Teach your children how to think, not just what to think & A Great Giveaway! As I write this post, I am speaking at a conference in Wales with families from all over the world. "Go into all the world and make disciples of all nations, teaching them to observe all things I have commanded you." Drinking tea in cathedral cafes with friends from different countries, jumping from subject to subject, hearing stories from all ages, has made my trip to the UK for Sarah's wedding rich for my soul. As a seasoned missionary, who cut my teeth on the world as a young woman, I am probably most comfortable amongst people from many cultures and languages. Seeing a bigger picture of life gives scope to my own. I remember as a young woman in our international chapel in Vienna, Austria, being amazed that we had 40 countries represented on Sunday mornings. It was a little bit like glimpsing what heaven would be like. Now through London and on to Cambridge to meet with friends from 30 years ago, and spending 3 days with parents from all over Europe this weekend while speaking at a conference, causes me to see the fingerprints of God transcending through all cultures, all of history. These days give me a renewed glimpse into eternity where we will all be together to celebrate the ways God has worked through all peoples, all languages, to show His reality through His faithfulness through many diverse stories lived well. As a young mama, I wanted my children to see the whole world and to hear great stories of those who lived in other cultures, other generations--Amy Carmichael, Winston Churchill, Florence Nightingale, Wilberforce and others from the UK, the brave story of William Tell and Heidi in Switzerland, the rousing faith tales of brother Andrew and the story of Corrie Ten Boom, The biography of Ghandi, the tales of Mother Theresa, and so many great people from all over the world. Stories make deep roadways on the heart that become the basis for our children becoming heroes in their own lifetimes. But hearing about heroes of all countries, including the heroes of the Bible, grant such scope for imagination. 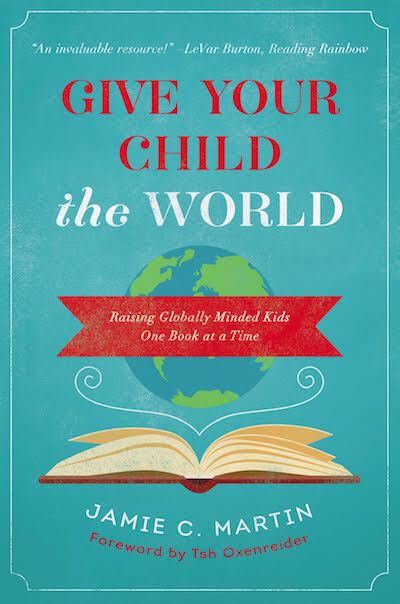 Another great book I am happy to give away to my readers this week is Give Your Child the World. When I received a review copy, I began to thumb through the book and thought, "I love this book!" I made a note to talk to Kristen about doing a podcast about it. Much to my surprise, after I corresponded with Jamie, I read her introduction. She had also worked in Poland like I had, she married a wonderful man from the UK, also a place I love. the more I read, the more I realized that she had a vision for her home and children must like mine! My brain juices began to work and I wanted to read more. As a woman who had spent years in missions, I wanted my children to meet people from all over the world, to study cultural and historical stories that would inspire them and show them how God could use them to reach out to their world in their lifetimes. Giving children an appetite for great stories helps all of us to engage in thoughts beyond our own realm, and increases our wisdom for life. I didn't just want to dump a lot of facts into my children's brains. I wanted to give them a heart for the whole world, to become Kingdom keepers for all of God's messages. I wanted to help my children learn to think well by exposing them to stories of great people from all over the world. And one of the ways I stretched my own children's brains was to read them hundreds of great books about people all over the world. I would follow up with, "I wonder where in the world God will take you to live your own story worth telling! I wonder how you will change the world with the messages God puts on your heart. And so, I loved seeing that this book combined both great books to read to stretch your children's understanding about the very international world in which we live, but also a challenge to help our children to think. The basis of fruitful education is giving a student a love for learning. Helping to engage a child's heart in knowledge, ideas, history, stories that inspire, thoughts that produce life and vision is the foundation for shaping a child into one who will grow intellectually the rest of his life. Great books and inspiring stories must comprise the shaping of a great mind. But to fully live well and to flourish in this era, we must help our children to be "world" Christians. Long ago, I was riding on a train through Austria. I had just finished speaking on a mission trip in Dubai, Macedonia, Poland, Hungary and Austria. As I was contemplating the trip our family had just completed, I remember God whispering to me. "You know, all of these people you spoke to come to me through their own cultural understanding and apply scripture through the Spirit's direction in their lives. I am not American. I am a God of truth beyond this time, your country and your small cultural misconceptions of me. I love the people in every country as much as I love American Christians. Worship me as I am in all countries." What a profound thought at the time. I did not even realize I was holding on to American Christianity and that I needed to see Him through a new lens. But God was speaking to me through my thoughts, my experiences as I was reading His word. The American culture has produced a generation of teachers and a philosophy of education that is often comprised of fill in the blank and multiple choice. Children are shaped by the idea that there is only one answer. Often, even as Christians, children are given moralistic instruction that indoctrinates them, but does not engage their mind in the life of ideas about God or their heart with faith. Moralistic instruction tends to be rule based and produces pharisees but not disciples. Rule based education produces children who can memorize and spit back what is expected, but does not necessarily prepare them to think, to develop convictions based on truth or shape their brains with ideas that extend creativity, and scope for life. Education of children in our homes must not merely give them facts to memorize and things to know, but real education cultivates the mental muscle of teaching children how to think. Strong thinking skills come from engaging minds in great books, interesting ideas, great minds, good writing. Discussion of ideas and stories gives children practice at learning how to evaluate, and own their own ideas. Writing opinions and evaluations of stories, political views, world shaping ideas develops mental muscles and increases the capacity of the students in strong thinking skills. Give Your Child the World is such a great book. Lists of literature about stories from all over the world are given as a guide to help us know how to immerse our children in stories and cultures all over the world. For children to stand up against wrong philosophies, they must have grappled with the fallacies and incorrect thinking of the world views that are not consistent with scripture. They must swim in ideas that are different and beyond their own cultural expectations. Having a comprehensive view of the world is a part of becoming His light to real issues that confront us on a daily basis. Working from a grid that is based on wisdom and knowledge provides real intellectual understanding. That is why books, literature, poetry and history are the basis of teaching children to think and to give them a broad understanding of the world, not just America. Instead of boring facts to memorize, children learn real ideas in the context of real people and great thinkers through time and in different countries and exercise their minds on the best minds that have lived throughout history. Studying God's word and memorizing scripture, discussing a Biblical world view and seeing the world from the eyes and experiences from different cultures is the food for great thoughts. Thinking properly is the basis of worshipping God with our minds. And so, understanding the importance of giving children practice at thinking, articulating their thoughts, interacting with stories and writing opinions is so important to building a soul that comes to truth from exercising their own minds. Children and adults who are encouraged how to think will be able to evaluate truth from fiction, clear thinking from indoctrination and will be able to hold confidently to truth in a world that denies the reality of God. So, today, ask a question, read a story, give opportunity for your child to think and to engage his personality and soul in the work of real education. And be sure to give your children a heart for the world! This is my third week to have the privilege of giving away some of my favorite books. This week, I will be giving away 5 copies of Give Your Child the World. Leave a comment about one of your favorite authors or stories of any kind and you will be entered in the giveaway. Thanks, Jamie, for this great book. Buy this great book HERE. Newer PostDiscipleship on the Go! Older PostOur Strength is Found in Trust--And In Pouring Out!